"Interoperability is essentially front page news now, and I think that's exciting," said Don Woodlock, vice president of HealthShare Platforms at InterSystems. "We spent all those years adopting EHRs, and now we're wanting to get the most out of them. Now we have the digital data, so it should be more liquid and in control of patients and put to use in the care process, even if I go to multiple sites for my care." "We're in the interoperability business, and we like having data being more available and more liquid, and systems being more open to getting data out of them," said Woodlock. "A lot of customers are starting to embark on their journey with with FHIR, and they're really bullish on this as well: having a standards-based API way to interact with medical record data," he added. "We're sort of at the beginning of that as being another giant breakthrough, I think, in terms of liquidity of healthcare information." With its new Essential Alerts project, clinicians can get notified when their patients are admitted to the EDs at most area hospitals with chest pain complaints, for instance, even if they haven't given express permission for it. The alert is limited to the patient’s name, initial symptoms, hospital, date, and time. That's enabled a big increase in the number of alerts fired, giving physicians more valuable insights into their patients' care while still complying with New York privacy laws. "We're really bullish on the potential of AI and in healthcare I'm always interested in seeing different use cases coming to fruition," he said. "I personally have been less focused on the 'out-doctoring-the-doctor use cases, because I think that AI obviously can be targeted toward knowledge work, where people are taking in data and making decisions about that data, and it seems like the physician role is one of the most complicated knowledge workers we have." Patient matching is an obvious and compelling place to start, and is "ripe for artificial intelligence to help out with," said Woodlock. "You can watch a person go through that, look at essentially the features of the two potential patients to see whether they match or don't match, and eventually learn the relationship between the features of the patients and whether they should be matched or not. There's a lot of very good artificial intelligence use cases that aren't necessarily getting into care decisions. "When you're leaving the hospital – if there's an automatic alert to your primary care physician or your care team that you are even in the hospital; you've left the hospital and here's the discharge summary – they can be a more active part of a successful transition into the ambulatory environment," Woodlock said. "Having that more robust awareness in the community of the fact that you were even in the hospital has a positive impact on this readmission rate." That's a "significant drop," said Woodlock. "And since you're not paid for those readmissions, that's real revenue for you." "When they had that more comprehensive view of their diabetic population, they actually had a larger percentage of patients that were getting A1c tests on time, and they actually moved up in their quality rating, and so got more revenue," Woodlock explained. "Their patients were actually getting the right care, they were just getting it at other sites that they weren't aware of. So now that they had that unified picture, they were able to demonstrate that they had a better quality quality outcome." 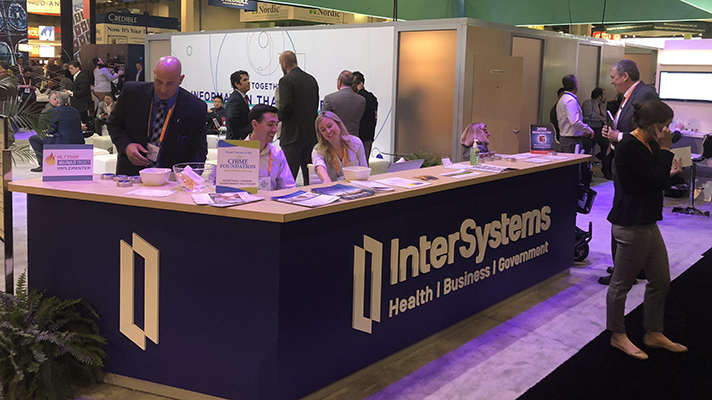 Healthix is one use case where AI and machine learning are at work, via InterSystems partner HBI solutions – which is helping the HIE's customer realize the benefits of advanced predictive analytics. "We do the work of aggregating and normalizing and deduplicating the health information across multiple sources, and what they do is leverage that data and build machine learning models that predict the likelihood of occurrence of many things happening in the next 12 months," said Woodlock. For example, a hospital might be able to see from the AI-powered analytics that a patient who presents at the ED with a broken bone also happens to have a 70 percent chance of getting diabetes, he explained. "You may then have a different conversation with the patient than you would otherwise, now that you know that," he said. The predictive alerts also offer a weapon against the opioid crisis, since "part of the behavior of people that have this addiction is they visit a lot of different EDs at a lot of different health systems, and it's very hard to put the puzzle together," said Woodlock. Moreover with the HBI machine learning technology, "you would see that they would have a higher risk of opioid abuse let's say, and it would look at ED visits as an example factor. So this is a kind of a probability scoring on an individual patient level,” he added. “The AI is kind of put to use on an individual care basis to identify risks or to help with directing population health health activities."